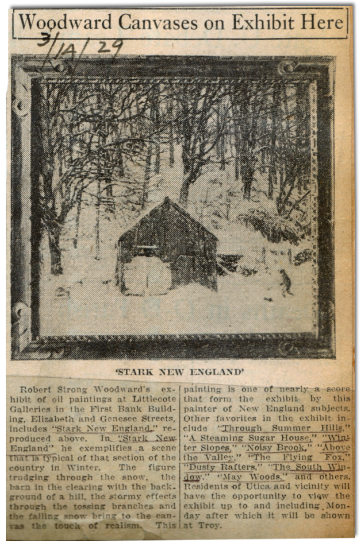 RSW- Artwork page, "Through Summer Hills (Chalk)"
This is 1 of 5 pieces related to the Charlemont Bridge which was destroyed in the hurricane and flood of 1938. Checkout the Scrapbook story on Through Summer Hills for more. “Painted prior to 1939. 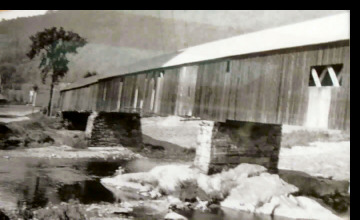 The covered bridge at Charlemont, Mass. Painted in the Buckland studio from older 25 x 30 made several years previously and the 25 x 30 destroyed. Also made a chalk drawing of the same subject which is owned by Rev. and Mrs. Matthews of Pelham Manor, N. Y. (see Through Summer Hills (Chalk)." Utica, NY, 1929, mentions the original painting. It is believe that it was this is the 25 x 30 painting that Woodward created the subsequent other paintings and chalk then "destroyed." In his diary comment, Woodward does not give the year this painting was made other than to say, "several years previously." It is conceivable that Woodward greatly under estimated the length of time from when he painted it since he was doing this from memory. According to Mark Purinton's first hand account the painting was, "was stored out in the frame room with countless other unfinished paintings as well as those with a purple "D" painted on the backs. (Please see that essay.)". The question does remain, why did Woodward exhibit a painting that was not satisfactory to him?. In any case, this painting is NOT listed in the Complete Works List because it was destroyed. The 1920's painting was mentioned in two articles related to the exhibitions it appeared. To the right, is the article connected with the Littlecote Gallery Exhibition and below is a quote believed to be related to the 1928 exhibition at J.H. Miller Galleries. on in the hurricane and flood of 1938. See also: Through Summer Hills, Charlemont Bridge, The Long Bridge and Down Through Summer Hills for all the pieces related to this subject matter. This is the chalk drawing referred to in the Diary. This Chalk now hangs at Memorlal Hall Museum in Deerfield, MA. The bridge was destroyed by the hurricane of 1938, prompting RSW to create the new painting and chalk from the unsatisfactory mid-1920's version of the scene.